It was my first meal back from Hong Kong, and I was craving for good eggs and coffee. A good brunch spot that I haven’t been. I have heard about this café for a while now as it has been around for a couple of years and have been reviewed by many food bloggers! It was interesting to read some of the reviews, the main key messages were that it has great food, especially the crab omelette and that the owners didn’t allow you to take photos of the food! Some weren’t too impressed with the chef, but I thought he was friendly and my experience was quite the opposite actually. I sat down and was greeted by the chef. The first thing he said to us (my brother and I) after he said hello was ‘so which food blog is yours’? I smiled at him and laughed and didn’t say anything. I can see why he thought we were food bloggers, my brother came in with his fancy camera and I had my camera – we either looked like tourists or food bloggers! I have never really been asked that so was a little surprised (in a good way that is! ), nor have I thought as myself as a ‘food blogger’. 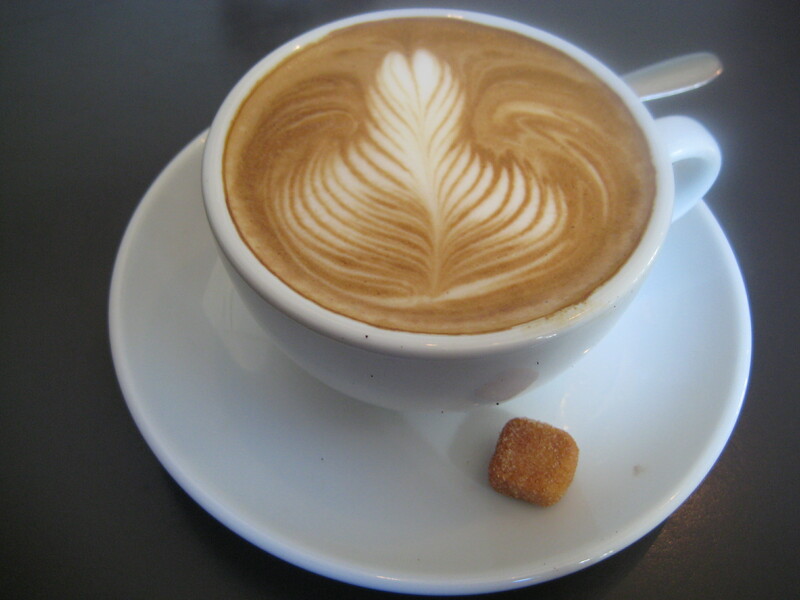 We started off with coffees, me, a skim flat white and I have to admit, it’s a pretty damn good coffee! The texture was incredibly smooth and aroma fantastic. 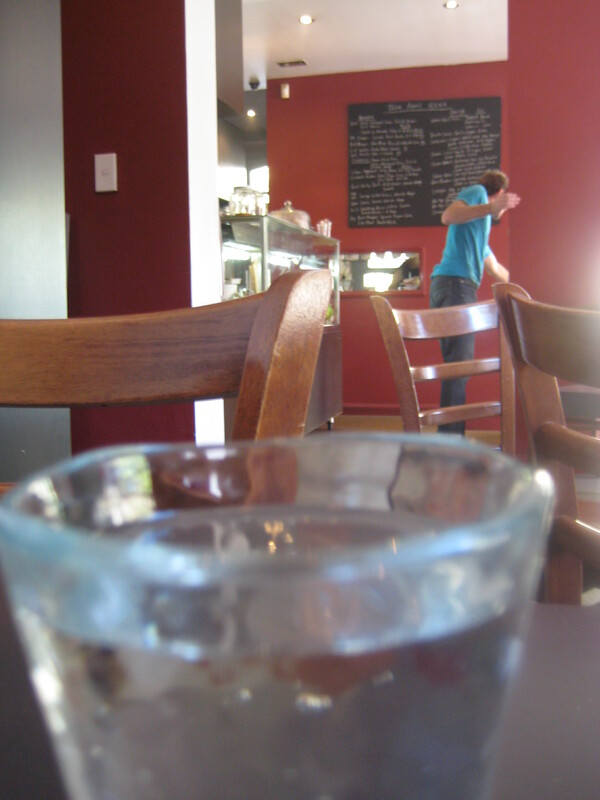 I forgot how good coffee was in Sydney, as I am so used to drinking mediocre (or crap) coffee in Hong Kong. 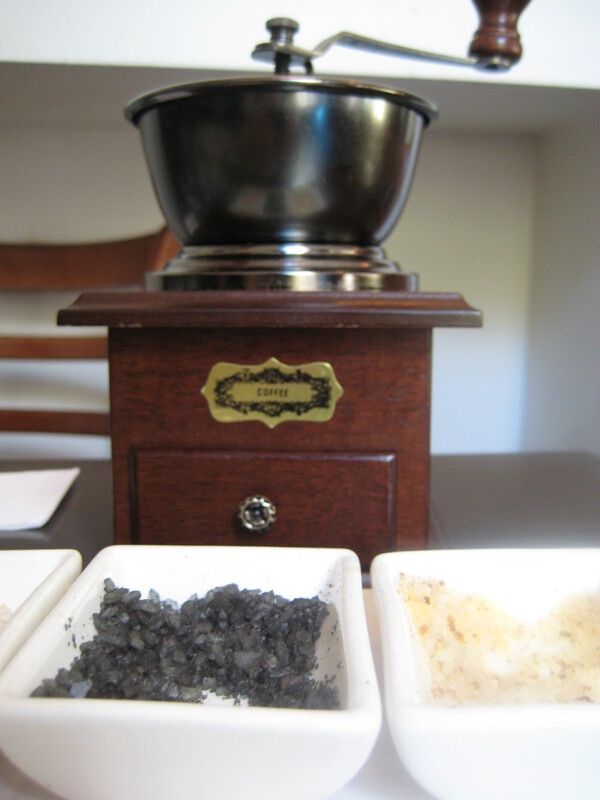 Whist waiting for our food, the waiter brings out a condiment plate with three different types of salt and a very very cute coffee grinder which has been turned into a pepper grinder! It was quite a novelty, you pull out the wooden drawer and that’s where the ground pepper can be found. I wanted to take it home! The chef, Josh, came to take our orders. 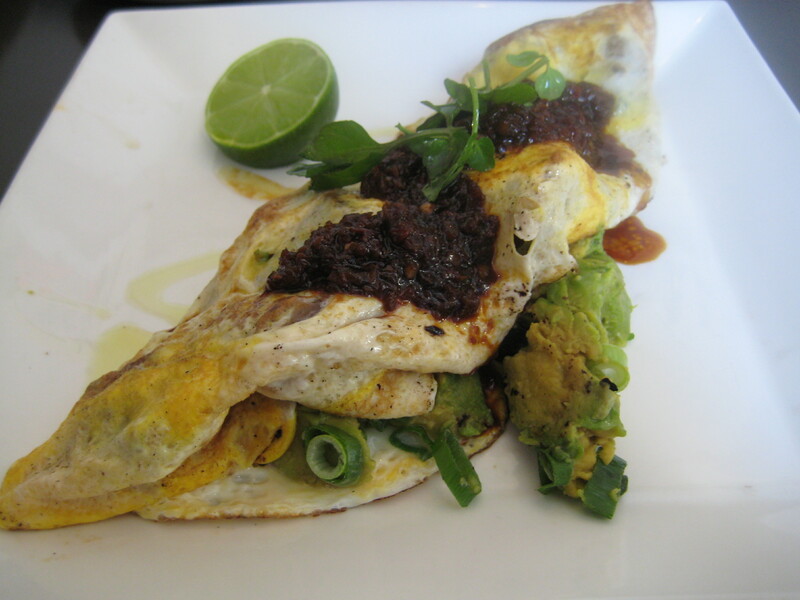 I couldn’t go pass the soft shell crab omelette with avocado salsa, garlic, chilli, soy and ginger sauce. I have heard how good this omelette was that I really had to try it myself! The omelette was huge! It had a GENEROUS serving of soft shell crab and the avocado salsa was a great compliment. The soy, ginger sauce with the chili was just amazing. The omelette was paper thin, and the flavours were just unbelievable. It was fantastic, it was as good as everyone had described it – it truly didn’t disappoint! My brother, F, ordered the ‘Big-Ish’, which consisted of 2 eggs, tomato, emu sausage (they ran out of croc sausage), mushroom, toast and beans. F had his eggs scrambled, and had a damper roll for his bread. 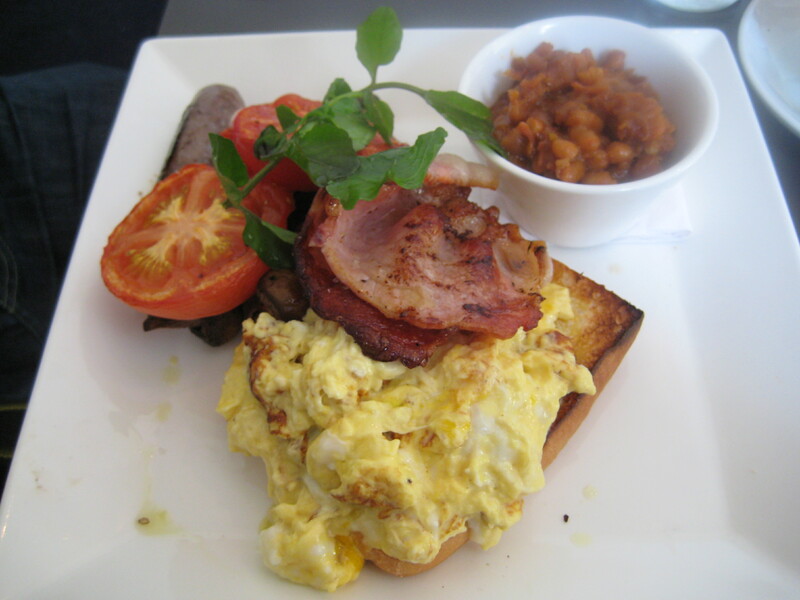 The scrambled eggs were absolutely creamy and tasty, the emu sausages, delicious and the beans… OH MY GAWD.. The beans were full of flavour with tender chunks of pork – it was definitely one of the best beans I have ever tasted!! Josh came out of the kitchen as I paid the bill, and he again asked what the name of my blog was – told him and he snickered! “Gastronomous Anonymous, great name” he said. Again, I will have to thank my friend P for coming up with the name! Café ish has moved, still in Surry Hills but no longer on Albion Street. It is now at Campbell Street which is just around the corner from my apartment! Pity I am not living there at the moment, but I am hoping this café will still be at Campbell Street when we come back at the end of the year. I know Hubby would definitely love the soft shell crab omelette! They are open every day for breakfast and lunch and for dinner from Wednesday through to Saturday! I am definitely keen to try the dinner! As I left, I noticed a little message underneath the sign of café ish ‘Native Australian / Japanese. No sushi!’. If you haven’t been, I would strongly recommend it. The food is just simply fantastic, it’s simple and reasonable. The atmosphere is relaxing, and I personally thought Josh was quite charming! I have to say, this could be my new favourite café in Sydney! It was definitely the best first meal back! I will definitely be back! really?? that’s weird…i found the meal pretty average. i had the baked beans with toast and the beans were so dry and tasteless. I had to add HEAPS of pepper and even then I barely finished it. hmm. maybe i need to go back and retry it? ya i really enjoyed it! the beans i thought were great! when did you go? I want those beans!!!! I think the diced pork made the world of differences. Mel I remember that batch, pop in again and let me know, I will shout you. new menu due out soon and lots of promos..self promotion here we come. Wed night, “Rib night” 90 mins $35, they are bloody awesome!! and coming soon to Sundays….”Sake Sundaze” 11am – 9pm $6 sakes and Izakaya style food. Josh, i think i will take mel there again for brunch / dinner! Am definitely keen to try the dinner that’s for sure! can’t go pass the omelette – it was just divine! something online, do you post on O.R. too?